NATURAL HABITAT AND PREFERRED SITE: Well-drained soil at altitudes of 3,000 to 8,000 feet are the native habitats. Arizona cypress grows wild in the Chisos Mountains of the Big Bend National Park in Brewster County but adapts to a wide range of soils in other parts of the country. Can be found from Texas to California in zones 7-9. 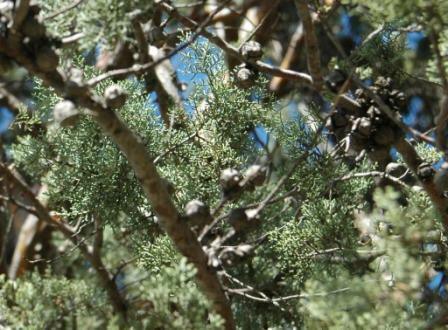 IDENTIFICATION INFORMATION: Arizona cypress is an evergreen tree that reaches an ultimate height of 90 feet. It has stout horizontal branches and a conical or rounded crown or sometimes an irregular shape. Tends to be more upright when young and more spreading with age and has aromatic bluegreen, evergreen foliage. FLOWERS AND FRUIT: Flowers are inconspicuous, small, borne in the spring and monoecious (male and female flowers on the same plant). Males are small and pale yellow-green at ends of branch tips; females small and light green near branch tips. Fruits are cones, ¾ to 1inch long, dark reddish brown, maturing at the end of the second year. They are dry, round, woody, 1 inch in diameter, 6 to 8 pointed scales, initially green but turning brown when they mature in two growing seasons and remain on branches for several years. There are numerous dark reddish brown seed that are compressed and winged. 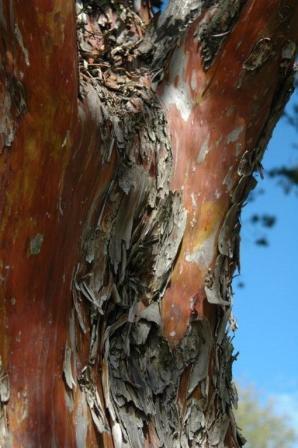 BARK: Colorful and flaky becoming dark reddish brown with age. A sticky sap will often be present. FOLIAGE: Aromatic blue green, evergreen foliage. The leaves are minute and scale like about 1/16 inch long. CULTURE: Arizona cypress is relatively easy to grow in most soils that drain well. It likes west Texas, a dry climate or at least a well-drained site. It is drought tolerant and needs little fertilizer. PROBLEMS: Over fertilizing and/or over-watering can cause various root fungal diseases and other problems. Heat and humidity can be tough on this tree. PROPAGATION: Arizona cypress can be grown easily from seed. Germination occurs in 2 to 3 weeks. Cones can be open by sun drying prior to planting. Propagation by cuttings is also possible. INSIGHT: Arizona cypress is an excellent Christmas tree when young. 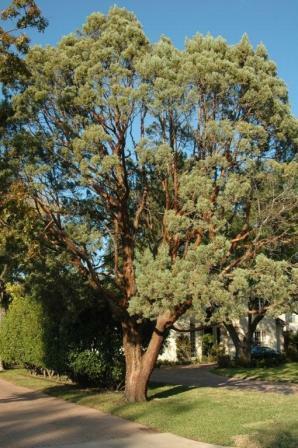 It is an excellent tree to plant in the western part of the state and should be used more. It should be avoided in high rainfall and humid areas.